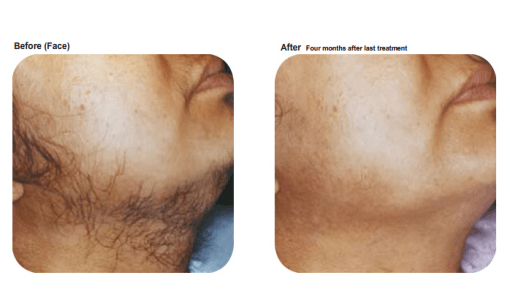 Laser energy is a highly effective and proven method to remove unwanted hair on the face and body, which can often be a personal issue for men and women of all ethnicities, ages, skin colours, and hair colours, often impacting on a person’s confidence. Laser hair removal is an excellent choice of treatment for any one wanting a permanent solution to reduce and remove unwanted hair, and alleviate the irritations that other temporary methods of hair removal can cause such as cuts, burns, itchiness, dryness and ingrown hairs. Laser hair removal treatment works by a process called selective photothermolysis, which means getting the right amount of laser energy to destroy the hair follicle without damaging the surrounding skin. The laser targets the melanin (dark pigment) in the hair follicle and shaft, and by using melanin as a conductor, laser energy travels down to the root of a hair follicle, and the energy converts to heat, which damages the hair follicle so that it no longer produces hairs. Sheer Laser Clinic offers Laser Hair Removal treatment using the industry’s Gold Standard, Lumenis Light Sheer Duet which is FDA approved and in a class of its own. Its superior safety and effectiveness have been proven in extensive clinical trials and long-term clinical practice. It is the only laser system with unique dedicated technology for pain reduction, enhanced efficacy and safety. The Light Sheer Duet is suitable for all areas of the face and body as well as all skin types (even tanned skin), with minimal discomfort and recovery time. This award-winning laser hair removal system uses a diode laser that is specially designed to remove unwanted hair faster, more comfortably and safely. What is the difference between Laser and IPL (Intense Pulsed Light)? When considering treatment for Laser Hair Removal, it is important to understand the difference between Laser and IPL. IPL machines are not lasers. The main differences between Laser and IPL mainly lies in the technology that each use to generate light energy, as well as the different properties of the light being used. 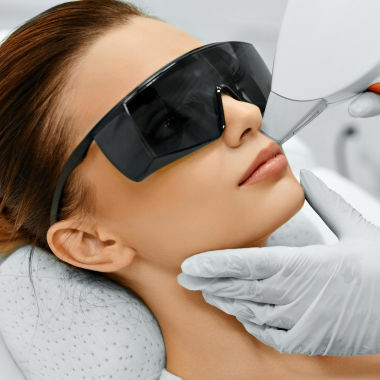 Laser machines produce a single wavelength of light (pure light consisting of one single colour and form), which has a very concentrated beam and specific target (the melanin in the hair follicle). Laser machines create more heat directed at the hair follicle than IPL systems, hence achieving better results. Because the heat is absorbed by the follicle, and not the skin, there is a decreased risk of burning when using Laser machines. This also makes Laser a safer option for darker skinned individuals. IPL machines produce a broad spectrum of wavelengths (like a light bulb) and cannot be focused to a concentrated beam. Because a range of different wavelengths are dispersed at a variety of depths only some of these will be effective for hair reduction. In addition, some of the light can be absorbed into the surrounding tissue as well, leading to heating of the pigment in the skin. This is why there is more of a risk of burns for a darker skin type. IPL machines have an important place in treatment of the skin. The non-specific nature of an IPL is what makes the treatment so effective when targeting skin problems, such as pigmentation and fine blood vessels. Male grooming, and particularly laser hair removal has become increasingly popular in most recent years, as men now display a far more open attitude towards beauty and aesthetic treatments to improve the way they look and feel. Excessive hair growth in men is often caused by excessive levels of testosterone, but this is not always the case as genetics, age and ethnicity also play a part. Just as hair maintenance is a nuisance for women, it is equally so for men, especially on noticeable or difficult to reach areas such as the back, shoulders or neck, which is why painful waxing and irritating shaving is becoming a thing of the past as more and more men are opting for long term permanent results, rather than short term methods of hair maintenance. All areas of the body are treatable, with the most popular areas typically being chest, back, shoulders, abdomen, neck and cheeks with increasing popularity to treat hands, arms, legs, feet and buttocks; and just as bikini lines are most popular with women, so too are speedo lines with men. Heredity and ethnic background constitute the primary causes of hair growth. Superfluous or excessive hair growth in women often results from normal biological changes that they undergo throughout life, such as puberty, pregnancy, menopause and as part of ageing. Any one of these changes may cause an increase in hair growth in areas that never had hair before, or cause a small to moderate problem area to worsen. Other causes of hair growth can be associated with certain medications, stress and obesity. More serious causes can be an abnormality in the endocrine system, such as irregular menstrual cycles; ovarian disorders, such as Polycystic Ovarian Syndrome (PCOS); and thyroid abnormalities. Laser light is selectively absorbed by melanin, the pigment in the hair follicle. The light energy heats the pigment and effectively destroys the hair follicle without damaging the surrounding cells. If you’ve ever noticed how dark clothes absorb sunlight & heat up on a hot day; you’ll begin to understand how the pigment (colour) in a hair follicle absorbs heat from the laser. During laser hair removal, the laser targets the coloured pigment in a hair follicle and shaft. The light from the laser is absorbed by this pigment and the energy converts to heat, which damages the hair follicle so that it is no longer able to produce hairs. 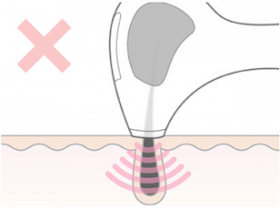 Using a handheld laser hair removal device, we are able to treat hundreds of hair follicles at a time, removing hair from anywhere on the body. Laser hair removal is only able to target the hair follicles that are in their active growth (anagen) phase, which means that any follicles that are dormant will continue to grow hair as usual once they enter their active phase. This is why we may need to carry out several treatments to laser as many active hair follicles as possible, and give you the best long-term reduction in hair growth. 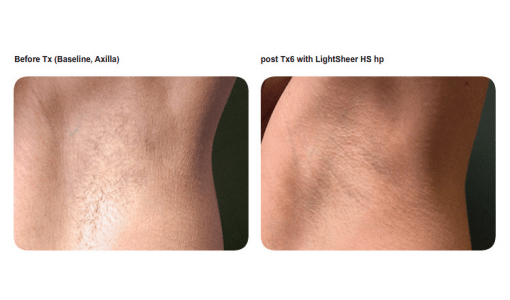 The Light Sheer Duet laser hair removal system is clinically proven to be both safe and effective. It has an exceptional safety record and is the industry’s Gold Standard for laser hair removal. It is important that the treatment is performed by a certified and trained professional. However, as with all treatments, there are some contraindications which need to be considered and will be discussed with you during your consultation to ensure your safety and suitability. Who would be performing the procedure? At Sheer Laser Clinic, Laser Hair Removal treatments are only ever delivered by one of our highly trained and certified Aesthetic Practitioners, who will be able to tailor the treatment to suit your skin and hair type. Due to a change in government policy, lasers in the UK are not regulated which means anyone can use a laser and no one is checking the machine’s safety or the therapists’ training and skills. However, at Sheer Laser Clinic, we strongly believe in the safe delivery of all treatments and only employ certified and experienced therapists, using state-of-the-art machinery which is CE marked. Our Clinic is also licensed by the London Borough of Richmond with a Special Treatment Licence, complying with strict guidelines on training and safety. The Light Sheer Duet uses ChillTip™ technology cooling system to momentarily numb the skin to minimise pain. You will most likely experience some level of manageable discomfort commonly described as a pinch or a zap, however the sensation is only momentary for the moment the laser is being pulsed. Most clients find the treatment to be significantly less painful than they expected. For those that are accustomed to waxing, they feel it is far less painful than waxing. We will perform a patch test before performing a full treatment, so you will experience the sensation before committing to the full course of treatments. The time taken for a treatment is dependent on the size of the area(s) being treated. This can vary from 10 minutes for the upper lip to 45 minutes for full legs. After each laser hair removal treatment, you will have a hair-free period once the treated hair has shed. Regrowth will occur but this should be thinner and more patchy after each session. Most people say they see a noticeable difference after their first treatment. It is worth noting that some hair is thicker and has deeper roots so will take longer for noticeable results in these areas; the is perfectly normal. What will happen before my Laser Hair Removal treatment? We will ask you to attend a consultation before your treatment so that are can find out more about the area of concern, medical history and skincare routine. We will also perform a patch test at this appointment and you will be provided with a before and after care plan which we will ask you to follow. 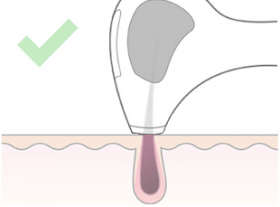 It is important you shave the area to be treated 24 hours before the treatment to avoid irritation. The Laser light is aimed at the body area to be treated and a short pulse of light is released, which targets many follicles simultaneously. 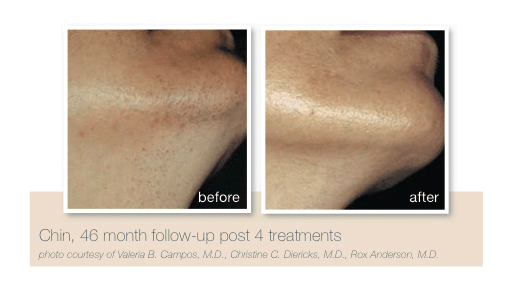 The Laser is then moved to the adjacent area of skin and the process is repeated until the entire area is treated. What do I need to do after my Laser Hair Removal treatment? You will be given clear aftercare instructions when you undergo Laser Hair Removal treatment at the Clinic. You are allowed to shave in between treatments as this is the only method of hair management, which does not remove hair from the root. Remember, you need the root to be present for your treatments to be effective. You will however notice that the need to manage your hair growth will be reduced considerably right from the very first treatment. The three stages of hair growth are the Anagen (growth), Catagen (transitional), and Telogen (resting) phases. Once the cycle is complete, it restarts and a new strand of hair begins to form. Hair must be in the active growth phase for treatment to be effective, as this is when the hair is still connected to the base of the hair follicle. Each strand of hair on the human body is at its own stage of development, which is why multiple treatments are needed over time to treat all hairs during their growth stage. The number of sessions needed are dependent on the individual and can also be dependent on medical background and hormonal changes in the body. Depending on the thickness of the hair and the area to be treated, we recommend a course of 6 treatments to begin with, after which top-up sessions are available if necessary. Your therapist will advise you at your consultation the best option for you to achieve optimum results. What happens if I finish my course of treatments and still have unwanted hair? It is natural that some hair will still be present, though significantly reduced following a course of treatment. Your therapist will discuss a bespoke maintenance or ‘top-up’ package. However, in some cases the continuation of hair growth may be due to Polycystic Ovary Syndrome (PCOS). At Sheer Laser Clinic we offer a 25% reduction for all clients who are afflicted by PCOS. To ensure the best results, we recommend a treatment every four to six weeks for the face, and six to eight weeks on the body, over six sessions for a permanent reduction in hair growth. This varies from person to person. Your therapist will advise when your next treatment should be scheduled. 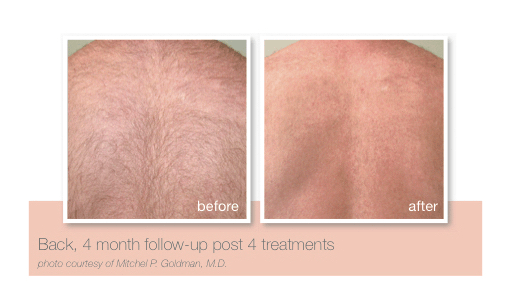 After a course of treatments, your hair growth should be permanently reduced and hair follicles that successfully absorb the laser will never grow back. Hair follicles that are dormant or reactive with age or hormonal changes may reappear but will be lighter, finer and fewer. Laser hair removal is the only clinically proven treatment for the removal of unwanted facial and body hair gently, quickly and effectively with long lasting results. On average 80-95% of lasered hair is permanently gone after a recommended course of treatments. There are common side effects experienced immediately after a treatment such as temporary erythema (redness) or temporary per-follicular oedema (swelling/lumps). Sometimes the skin can even feel a little itchy or tender to touch. These are all signs of a good treatment and usually disappear within 24 hours but sometimes can take up to 72 hours. There is also a slight risk of hyper and hypo-pigmentation. This is the darkening and lightening of the skin, which is why it is important to protect the skin from the sun using UVA and UVB protective sunblock of SPF 30 or above. We can advise you on the best products for your skin to avoid this from happening. In very rare cases, people can suffer from temporary blistering and scabbing. In all instances, any adverse reaction you experience should be discussed with your therapist. Many people feel that laser hair removal has set them free from the almost daily grind of shaving, or the problems associated with waxing, especially painful in-growing hairs. If you’re looking for a long-term way to reduce your hair growth and boost your body confidence, then laser hair removal is ideal. 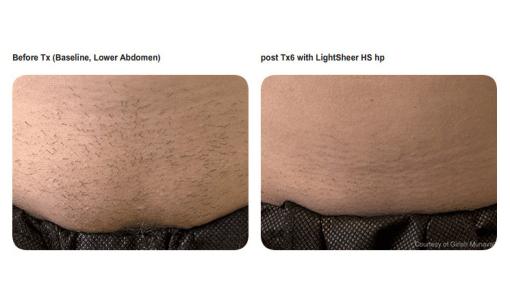 Laser Hair Removal with the Light Sheer Duet has been designed for all skin types; even the most sensitive skins. We recommend that you come into the Sheer Laser Clinic for a free one-to-one consultation to help determine whether Laser Hair Removal would be right for you. Most people are suitable, however best results are seen with people who have light skin and dark hair. Grey/white hair has no melanin so is not suitable for treatment. Who should not have Laser Hair Removal? Can I have Laser Hair Removal if I have a suntan? While we do treat darker skin types and those who hold a suntan in their skin, we prefer not to treat freshly sun tanned skin, this includes fake tan. Before your treatment, your therapist will ask you about your recent sun exposure and may ask you to delay your treatment if the exposure is intense and recent. We take the safety of our clients very seriously so please always be honest as this is to protect the safety of your skin. A significant number of our clients are men, treating all areas of their face and bodies. Can you treat Asian / Afro Caribbean / darker skins? At Sheer Laser Clinic we use the LightSheer Duet laser system which is safe and effective for treating all skin types, tones and colours in the Fitzpatrick Skin Type Scale. The effectiveness of laser hair removal depends on the characteristics of each individual. Your therapist will advise on your suitability, as hair texture and pigment are also necessary considerations. Therefore if the risk to your skin is greater than the success of your treatment, then you will be advised of this risk and encouraged not to proceed with treatment. Does Laser Hair Removal work on all hair? For the treatment to be successful, there needs to be pigment in the hairs being treated. From experience, laser treatment is not effective on pure blonde, white or grey hair. 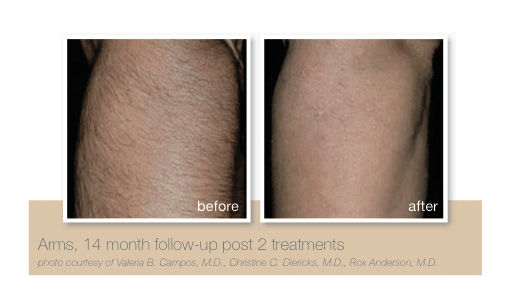 The result from laser hair removal cannot be matched by traditional methods of hair removal. Traditional hair removal methods, such as waxing, shaving, depilatory creams, plucking/tweezing, sugaring, and threading provide only temporary results – some for fewer than 24 hours. 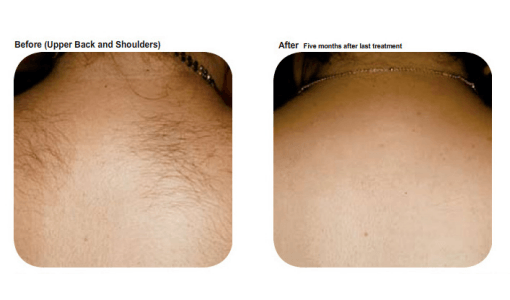 Laser hair removal is a long-term hair removal solution, giving you a long-lasting, permanent result. 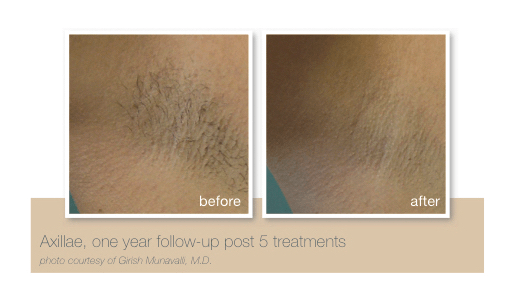 In only a few treatments (recommended six to eight) we can clear your skin of unwanted hair. Laser treatment has another advantage, in that you never have to let the hair grow out a few days before your treatments in order to get it to work, as you do with other methods. 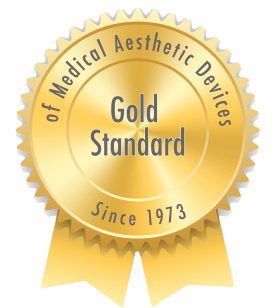 It is the Gold Standard in lasers for hair removal, and is particularly popular because it delivers outstanding results for all skin types, skin colours, hair types and most hair colours. Stay up-to-date with the latest news, products, exclusive, offers and events! By entering your email address you are confirming that you would like to receive our Sheer newsletters. Please note that you can unsubscribe at any time.